Over 120 million people around the world use Zello to talk to friends and family, engage in what we call social radio and, when circumstances demand, help each other during emergencies. In mid-August it became clear that Hurricane Harvey had the potential to do a lot of damage to states on the Gulf of Mexico. As it turned out, Harvey was a catastrophic storm. It made landfall in south central Texas and proceeded to park on top of east Texas, dumping torrential rain for days. 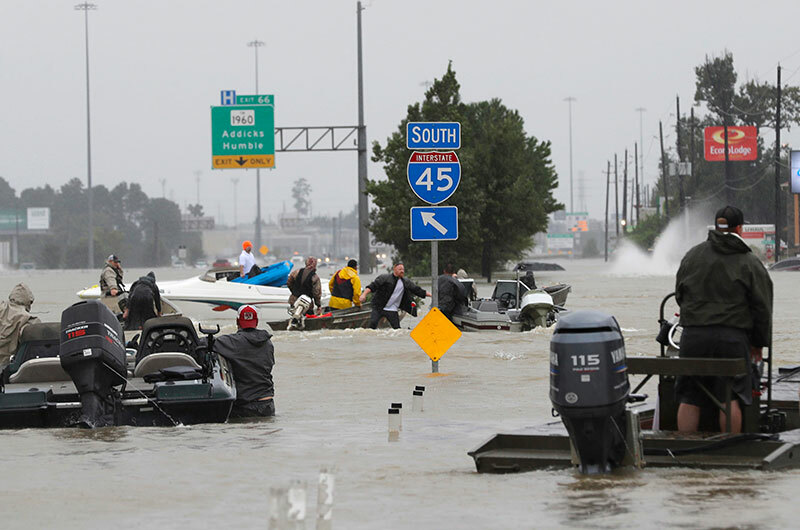 The Houston area is flood prone, and as the rainfall totals rose past 15 and then 20 inches, even areas that had never flooded were underwater. Very significant portions of the US's 4th largest city were submerged. The Cajun Navy - an organization that came into being in 2005 in the wake of Hurricane Katrina - sprung into action, and was soon joined by many, many others. A collective of boaters, military veterans, truck owners and a host of others made their way to Houston to help. And following the lead of the Cajun Navy, this ad hoc band of collaborators used Zello to connect with each other and coordinate search and rescue. The Cajun Navy channel was an overnight sensation (now it has over 40,000 members), and media coverage of the group's magnificent work, and Zello's role, quickly caused our own servers to light up with new users. And as the extent of the disaster became clearer, numerous specialty channels sprung up. Some were dedicated to efforts in particular parts of the city and region. Others were focused on specific activities. People on the Harvey Animal Rescue channel to get to stranded, severely injured horses, and to a dog shelter on high ground with a dog population many times the shelter's capacity. Remarkably, many of the ever-patient moderators of this channel appeared to be outside of Texas. They were people who got on the channel and ended up helping to run it. Remarkable. As Zello's use grew, so did the media coverage. We spent that week talking to virtually every major newspaper and cable network. And downloads of Zello began to soar. Then came word of Irma, and things got really crazy. All of a sudden Zello was the most downloaded app on both the Apple iOS and Google Play app stores. There were times when we were processing 120 new Zello users per second. When we took stock of the week of Irma we found we'd taken on 6 million new users. We had a truly amazing conference call with a group of Cajun Navy channel moderators in early September. These women were all new to Zello when they joined to channel to offer their assistance. Each was pressed into service as a moderator without any real idea of how to do the job or best make use of the Zello app. Zello never went down, even as we were adding one million new users per day. This is a platform that organizations can rely on. 2. Zello runs on low bandwidth networks. With widespread power outages in Houston and Florida, Zello's ability to run on even 2G data networks meant that it was often available when nothing else was. 3. Zello is easy to learn. It took mere hours for new, non-technical Zello users to successfully dispatch and coordinate search and rescue teams in life-and-death situations. The learning curve is short. 4. Voice messages forge close bonds. Geographic separation of moderators and search and rescue personnel was a non-issue. Real-time voice communication forged effective human connections in circumstances that demanded deep trust and complete clarity. We're a Texas company, so we feel the Houston area's profound, ongoing pain every day. At the same time we are burning with pride knowing that our passion played a role in many, many rescues and undoubtedly helped save lives.